Save on your next flight from CKD to CEC when you book through Travelocity. Need a last-minute flight to Crescent City? Travelocity offers discount airfare no matter when you book, even on popular routes such as Crooked Creek Airport to Jack McNamara Field Airport. Whether you need a direct or indirect flight, you can trust Travelocity to provide you with the best prices for CKD to CEC flights. Explore Crescent City with Travelocity's Travel Guides to find the best flights, cars, vacation packages and more! It would be nice to have hot breakfast in the morning. Brand new Oceanfront Home With Amazing Views! Situated in Crescent City, this vacation home is within 2 mi (3 km) of Castle Rock, Brother Jonathan Park, and Del Norte County Historical Society. Battery Point Lighthouse and Beachfront Park are also within 3 mi (5 km). 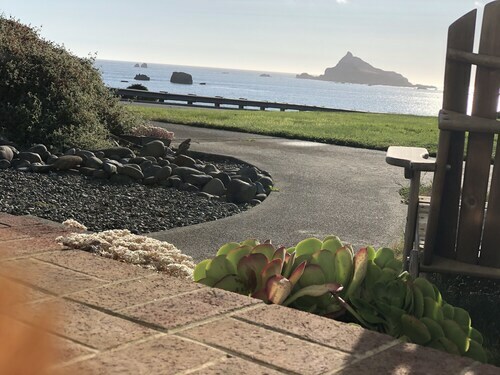 Situated by the ocean, this vacation home is 0.5 mi (0.8 km) from Castle Rock and within 3 mi (5 km) of Brother Jonathan Park and Del Norte County Historical Society. Battery Point Lighthouse and B Street Pier are also within 3 mi (5 km). Coastal Cove Beach Bungalow! Beach Walks, Whale Watching, Agate Hunting & More! Situated on the waterfront, this romantic property is 0.6 mi (0.9 km) from Castle Rock and within 3 mi (5 km) of Brother Jonathan Park and Del Norte County Historical Society. Battery Point Lighthouse and B Street Pier are also within 3 mi (5 km).